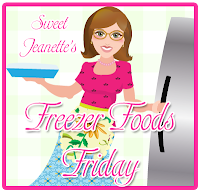 Sweet Jeanette: Freezer Foods Friday - Onions galore! But I'm getting off-topic aren't I? (sorta) This week my mom shared some of her abundance with me. I got a bunch of Florida Sweet Onions and I knew just what to do with them! FREEZE THEM!!! When we grill, we love grilled onions with our steaks! All I do is cut up the onions (grin) add some butter, soy sauce and squeeze some fresh lemon juice over it. Wrap it up in a "foil ball" and pop on the grill. Oh my! It is so go-ooood! TRY IT! Another way to use the onion chunks, is with cut up potatoes, soy sauce and butter, wrap that up in a "foil ball" and throw on the grill too. You can add fresh cut up mushrooms and peppers too. Oh so good! Ok, now it's your turn... got any good tips, recipes or ideas for us? Join in! I wonder if a food processor wood work to! I hate cutting onions! I have given you an award! Please come check it out at my blog! I have done that. But I don't have farmer's near me so it is the store for me. I have never tried sweet onions before. Hmmm...I just may have to do that. I found you on Bird Crafts and love your blog! What a great idea to put up lots of onions all at once. I love the sweet onions, too! I'll have to do a little preemptive preparation now! Thank you so much for your sweet surprises today. My post about you and your generosity will go up in tomorrow's post at midnight. Proper thanks will be coming in the mail. Thanks for the reminder to freeze onions when summer rolls around here in New England!